Oct. 4, the Feast of St. Francis, marks the culmination of the Season of Creation celebrated by Christians around the world. Many churches observe the Feast of St. Francis as an opportunity to renew their commitment to care for what Francis of Assisi called "our dear Sister Mother Earth." On this occasion, some congregations celebrate a "Blessing of the Animals" when people bring their pets to receive a blessing, thereby honoring creatures in the way of Francis. 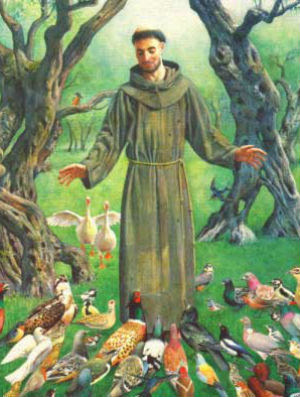 He held the animals with such deep respect that "Francis called all creatures, no matter how small, since he knew they had the same source as himself" (Bonaventure) - Sister Bird, Brother Wolf for example. He preached to the animals and even wanted the emperor to ask all citizens to scatter grain along the roads on Christmas Day so that the birds and other animals would have plenty to eat. Our hands imbibe like roots, so I place them on what is beautiful in this world. And I fold them in prayer, and they draw from the heavens light. In a show of defense of clean water and equitable distribution of natural resources, you can participate in a public resistance against a pipeline that is proposed under the Potomac River. Join "Hands Across the Potomac," an event organized by Chesapeake Climate Action Network. For event details and to RSVP, click HERE. This event will take place Saturday October 14, 2017 at 12 noon, in Sharpsburg, Maryland. During 2017 congregations throughout the DE-MD Lutheran Synod (and around the world) are commemorating the 500th anniversary of the Reformation. The DE-MD Lutheran Creation Care Team, in collaboration with Maryland Episcopal Environmental Partners (MEEP) is recruiting congregations to celebrate by planting trees through its 500 Trees Project. For more information or to sign up for tree planting next year, contact Deacon Laura Heller, lheller1@msn.com. Carroll Lutheran Village was motivated to participate by the enthusiasm of Jean Hauk, member of the Exterior Care & Grounds Committee along with Carl Martens (both are pictured left in the middle with Bishop Gohl), who helped design a planting plan with a wide variety of native trees. They were inspired to participate in 500 Trees by attending a Workshop led by IPC at Mar-Lu-Ridge Retreat Center. They successfully organized the planting of 60 native trees at Carroll Lutheran Village. On September 13, a gala celebration was officiated by Bishop William Gohl who blessed all the trees and the volunteers during a beautiful ceremony. Read more about this story in the Carroll County Times. We have reached and exceeded our goal of 15 "covenant" congregations joining the One Water Partnership. Congratulations to all these congregations who, in addition to forming or supporting their congregational Green Teams and signing a commitment, will also take at least 4 actions to improve their shared Jones Falls watershed over the next year: Beth Am, Brown Memorial Presbyterian Church, Cathedral of the Incarnation , Chizuk Amuno, Govan's Presbyterian Church, Har Sinai, Homewood Friends Meeting, Memorial Episcopal Church, Mt. Lebanon Baptist Church, St. Ignatius Catholic Church, St. Luke's on The Avenue Lutheran Church with six:eight Church, St. Vincent de Paul Catholic Church, The Church of the Guardian Angel, The Church of the Redeemer , Shrine of the Sacred Heart. Check out what you might do at your congregation by Clicking HERE for our full Menu of Actions. Email Bonnie Sorak or call her at 443-799-0349 for the details. Fill out this brief interest form and we'll follow up to schedule a conversation on your congregation's interests and capacity. Let's add your congregation to this list! Please join in the celebration of the 500 year anniversary of the Reformation by planting trees and learning about how to be good stewards of God’s bountiful creation at at Epiphany Lutheran Church, 4301 Raspe Ave, Baltimore, MD. At 2:00 PM, planting of Maryland native trees and fruit trees will begin. Following the planting, there will be information shared by the Delaware-Maryland Synod Creation Care Ministry on energy conservation, clean energy, clean water, community gardens, and other creation stewardship topics. Free plants and garden seeds as well as pumpkins and gourds will be available for participants to take with them. The day’s events will conclude with a joyful worship service beginning at 5:00 PM. For additional information please contact Deacon Laura Heller, lheller1@msn.com, 443-791-0248. Interested in learning more about how your congregation can save money through the Prince George's County Alternative Compliance Program? IPC staff are offering free one-on-one support to help you achieve reductions in your congregation’s Clean Water fee. This support is paid for by a grant from the Prince George’s County Department of the Environment, but is open to only 20 congregations. Questions? Contact Anna Awimbo at anna@interfaithchesapeake.org or call 410-609-6852. October 6 Film "Racing Extinction" 7PM. Unitarian Universalist Congregation of Rockville. More info HERE. October 14 Workshop: "Seed Saving in Your Garden" presented by UME Master Gardners, 9-10AM. Parks & People Foundation, 2100 Liberty Heights Ave, Baltimore. Click HERE for more info. October 14 Plant & Seed Swap, 10AM-12PM Parks & People Foundation, 2100 Liberty Heights Ave, Baltimore. Click HERE for more info. October 21 Eco-Reformation Day, 2PM with oyful worship at 5PM, at Epiphany Lutheran Church, 4301 Raspe Ave, Baltimore. October 25 BES Community Open House. Informal gathering hosted by Parks & People Foundation to share the research of Baltimore Ecosystem Study (BES). Free and open to all. 5:30PM. Click HERE for details. November 5 Film "Merchants of Doubt" followed by a panel discussion, 3PM, Brown Memorial Park Avenue Presbyterian Church. Click HEREfor more info. A One Water Partnership event. November 13 "Your Voice, Your Earth Take Action!" Learn from elected officials on how to impact state and national environmental issues in the year ahead. 6-8PM Van Gogh Cafe (300 S. Ann St., Baltimore). Registration is free and required. Click HERE for more info. November 16 11th Annual Trash Summit at Nationals Park in Washington DC. This year's theme is Transforming Communities for Clean Land, Safe Water and Healthy Lives. Early bird registration is now open. Not sure who your State Senator is? Visit www.mdelect.net and enter your address to search for your representatives. **Denotes Senators who are potential supporters, but have not confirmed yet. They need to hear your support of Senate Bill 610. Acting from our faith convictions, we join our voices with others in the region who call for responsible public policies that promote healthy watersheds. To bring about major change, public policies are needed to undo the harm that has been done to our environment, specifically the watersheds of the Chesapeake region. We citizens have a moral obligation to engage in the political process in ways that align with our values. Sign up to receive legislative action alerts and to be an Advocacy Leader. Gear up for the 2019 Maryland Legislative Session by making sure you're signed up for our Advocacy Leader newsletters and get ready to mobilize your community. Watch the recorded training from January 13, 2019, and get up to speed on priority legislation this session. Make sure you know who your state representatives are before the 2019 legislative session begins. Click here to enter your home address and see who represents you. Join us on Facebook or Twitter and be vocal about state legislation, or respond when we post important news. Help us track legislation in other Chesapeake states or in the District of Columbia. Email jodi@interfaithchesapeake.org if you can volunteer in this way. *** Our prayers and support go out to the family and friends of Maryland's Speaker of the House Michael Busch who passed away on Sunday April 7, 2019. Be a GIVER on Giving Tuesday, November 29th! We need your help to change more hearts and restore more sacred waters! Q: Are you confident that your congregation will begin to form a green ministry? This brief survey (23 questions) will help us understand your level of familiarity with the topics to be discussed at the workshop so that we can prepare properly. They are Yes-No questions, and it should take you about 5 minutes to complete. There is one question per page. Thank you for your time! Q: Would you be interested in serving on a planning committee for such a gathering? Q: Would you be willing to volunteer to help coordinate this experience for your congregation or in your region? IPC is considering developing an outdoor educational experience with a spiritual context as a means of helping faith advocates develop a greater sense of place within their watershed community. Such an experience might take place on the congregation's property, nearby natural areas, local streams or waterways, and could include hiking, biking, canoeing or kayaking, boating or even fishing. Your answers will not be public, but will be retained in our database for use in development of this program. Thank you for taking some time to answer these questions to help inform the development of such a program! As Blue Water Congregations gets underway, the Catholic Review highlights the underlying message that the faith community is uniquely called to care for Creation. Thanks Carl! Your contributions to the day were fantastic! When do we get to do this again?!? Tireless fighter. Servant Leader. Love all Creation and working to leave the Earth better than I found it. All views are my own.